Paladin is a Mozilla project to push 3D gaming on the Web. As a part of our efforts, we’re building a game engine called Gladius. We’ll blog proper introductions to both of these projects in the upcoming weeks. We’ve built RescueFox, a first prototype game, as a way to validate the Gladius game engine work we’re doing and find issues in the Gecko and Web platforms as well. Note that we do not intend this as a prototype for a larger-scale game. 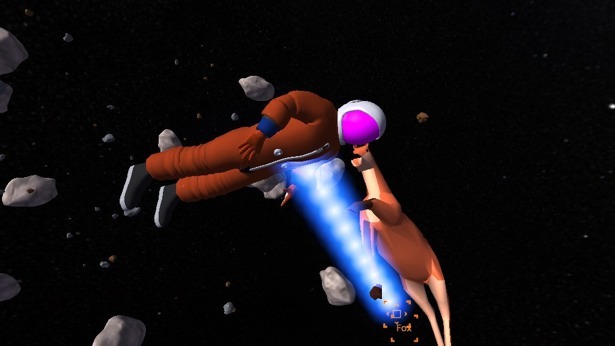 Don’t you hate it when you’re traveling at light speed, and your pet space fox escapes to an asteroid belt? I know it drives me nuts. Fortunately, you have an invisible fox detector to figure out where she is, and you can use a tractor beam that pulls you from asteroid to asteroid to the fox herself. And you’ve got about 90 seconds until she runs out of air. The game works in current versions of Firefox, and cursory testing suggests that works in Chrome on MacOS, albeit more slowly and without sound. If you’re interested in learning more about RescueFox, Paladin, and Gladius, or in contacting us, have a look at the (still-in-progress!) Paladin wiki page. RescueFox was developed to make sure that the Gladius gaming engine was really going to be suitable to build games against. CJ Cliffe started by doing lots of work initially directly against CubicVR.js, a great 3D engine that Gladius depends on. It’s the same 3D engine used to build the No Comply and Flight of the Navigator demos. Alan Kligman and Bobby Richter started porting chunks of it to the higher-level Gladius APIs, and I started working with some of the input APIs, the timer, and finding visual assets to use. This is where it started to get interesting. As we progressed, the game coding started to make clear to us that some of the factoring of the existing APIs was actually making the game more complex to build rather than easier. After more work, a super simple prototype engine that Bobby whipped up, and more discussion, we came to the conclusion that we needed to do some refactoring on Gladius. This was great, because it meant that we figured it out much sooner than we otherwise would have. We still needed a game prototype as a way to communicate more broadly the part of the Web gaming space we want our engine and the larger project to explore, so we mostly stuck with the lower-level APIs and did just enough work to make it basically playable. RescueFox was very much a group effort. Thanks ever so much to…. Apologies to anyone we’ve inadvertently omitted!